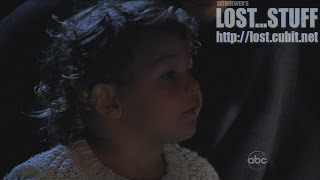 LOST: Season 5 Episode 1 - "Because You Left"/ Episode 2 - "The Lie"
Welcome back Losties! Is it me or did it seem like forever since the season 4 finale? The craziest thing is that the length of time between season 4 and 5 was a few weeks less than that between season 3 and 4! And you would think that me talking about TIME between seasons is pointless. But my friends, TIME takes on a whole new meaning in the world of LOST! As we have suspected and feared for quite some time now, LOST has headed into the dangerous world of Time Travel! I've always feared that this is where the masses were going to get confused and too frustrated with the show. We've been treated to some time-related episodes in the past couple of seasons through Desmond's stories ("Flashes Before Your Eyes" and "The Constant" which are 2 of the best episodes of the show!) as well as Ben ("The Shape of Things to Come"/ "There's No Place Like Home") but now everyone on the Island is dealing with the effects. 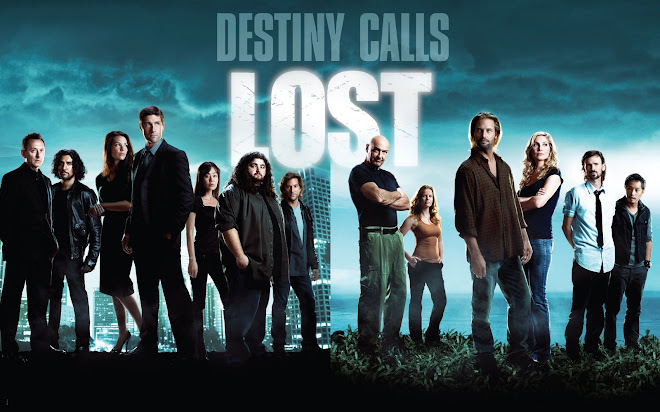 I guess when you're dealing with a confusing show such as LOST already and you're heading very close to the END GAME, then all bets are off! The story needs to be told and there can be no more dancing around! So naturally, my head is already spinning and I have tons of questions. But, that's why we have a blog here folks! Everyone brace yourselves because we're in for quite a ride! As for the first 2 episodes of the season? WOW!!!! 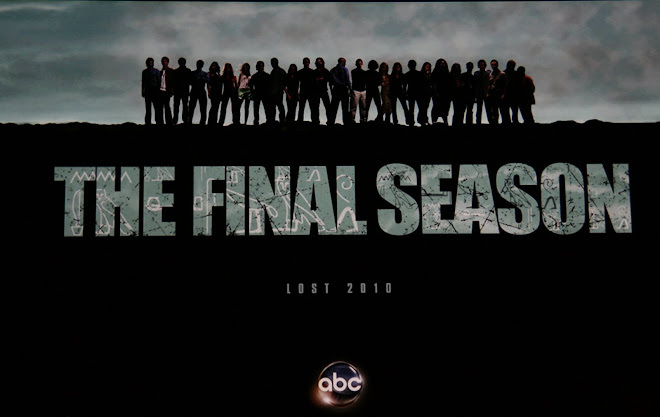 LOST is back! The new format of the show is pretty much how we assumed it would work at the end of last season. Since we have characters in two different locations (and times), we keep going back and forth from each storyline. So, this is a shift from the character-based stories of the past where each character would get their own episodes to shine. But, I wouldn't necessarily rule out the character driven stories from this season just yet. Let's get into the episodes. I've recapped both episodes individually as best as I can below! The season 5 premiere, like the season 4 premiere, doesn't waste any time picking up right where we left off. (Credit this to the defined end date and shorter seasons where as in season 2 and 3 premiere's they milked this stuff into 3-6 episodes!) We find out what happened to everyone on the Island after the Oceanic 6 left and we continue following the Oceanic 6 in events following where we last saw them in the finale. But first things's first, it wouldn't be a season premiere without some trickery in the opening sequence! We open up on a clock turning from 8:14 to 8:15am. We follow a man around his home very similar to following Desmond around in season 2 and Juliet around in season 3. We see his wife and child. He plays a Vinyl Record that begins to skip (sorry kids I don't know the song, but that's what the comments section is for! Updated: Willie Nelson's "Shotgun Willie"!! ) And before we know it, it is revealed that the man is none other than our favorite DHARMA Orientation guy, Marvin Candle (or take your pick of every other name he goes by). First of all, who didn't catch on that it was him? I'm not complaining, I still loved it! We went way back in time for this one. Notice I said that we saw Chang's Baby. Does this mean the baby was born on the island? Remember that crazy storyline about women conceiving on the Island would meet their doom before childbirth? Perhaps this was a recent development. I believe we had discussed this before, but this seemed to confirm it. Unless Chang took his wife off of the Island for some time. 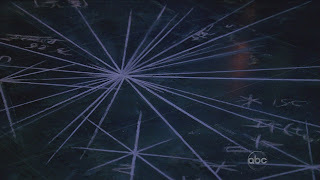 We learn in the Orientation Film for The Arrow (AKA the station where the Tail Section made camp and where Sawyer, Jin and Michael were eventually taken to meet Bernard) that the purpose of the station is to develop defensive strategies and gather intelligence against the island's hostile environments. Smoke Monster anyone? The Natives/Others perhaps? The video filming is interrupted because there is an issue at the Orchid Station, which is still being constructed! How awesome was that?! Anyway, some mining dude, down in the "DEEP" (as Ben referred to it) Depths of where the REAL Orchid station would go, was telling Chang how they found some kind of ancient wheel (the frozen donkey wheel!). Apparently the drill melted when they got near it. If you recall in the season 4 finale, the Orchid Station blocked off the path to the Donkey Wheel with the video giving explicit instructions to NOT put Metal in the Space/Time chamber. Chang seemed determined to not mess with that wheel as they wanted to harness the energy of the island to maniuplate time. Nice joke from Mining guy about wanting to go back and kill Hitler. All to reinforce the point that there are Rules that can't be broken. So perhaps we know for sure now that the Rules that Ben/Widmore have referred to are TIME-related. Killing Alex was against the rules. Perhaps even the reason some people cannot die yet has to do with the rules of time. If the energy is released for any reason then Chang gave a line that we hear at the end of our 2 episode onslaught. "GOD HELP US" I can only assume that we were intended to make a connection between the two scenes (and we'll get to the other scene at the end of the blog! So during this whole scene between Chang and Mining Dude, they kept showing distinct holes in wall. Maybe I missed them explaining that behind those holes was the crazy Donkey Wheel. But I'm guessing they're of some significance. Ohhhh right, Daniel Faraday is hanging out back in time with mining gear on! We're not quite at the Islander's storyline yet, but I'm gonna guess he's on some kind of mission to get to that wheel to "FIX" something! As stated before, events continue off-island right where they left off in the finale. Jack is still staring at Jeremy Bentham/Locke in the coffin. Ben is working on getting Locke into the van and Jack is sitting around feeling sorry for himself. Jack states that none of the other 5 are his friends anymore and wonders how this happened. This gives Ben the opportunity to state the episode name "It happened because you left Jack" Well....correct me if I'm wrong, but Ben was the one that LET them leave in the finale! Perhaps, he knew then that getting the 6 back on the Island was his ticket back onto the Island. He told Locke that you can never come back if you move the Island. I'm inclined to think that he may have told another classic fib. Their first man to recruit is Hurley because he's in the institution, they'll find out soon enough that may be more difficult than they first thought! Jack states that he changed his mind because Locke told him that Sawyer, Juliet and everyone else on the Island would die if he didn't come back. Oh and when Jack indicates that Locke didn't tell Jack what happened when the Island moved, what on earth does Ben mean by "Then I guess we'll never know"? If Ben's intention is to get back to the Island, don't you think someone would catch them up on what's been going on? (Assuming they arrive at the right time on the Island and all) You would think that is a throwaway line from Ben, but since their whole mission is to go back and save them, I'm not so sure I get it! The only other scene with Ben and Jack in episode 1 was with them seeing the news that Hurley fled the Mental Institution and is a suspect in the murder of the man parked outside (the one that Sayid killed). Oh boy! We continue with Sayid and Hurley after they make their run from the Mental Institution to the safe-house. For some reason, Sayid did find time to get Hurley some food from the Rainbow Drive-In. Sayid mentions that he killed the man outside the Institution because he's not taking any chances after Bentham/Locke died. Loved Hurley's "I need a codename" line! Then the big fight sequence with Sayid throwing a man over the ledge of the 2nd floor motel/apt. balcony, then fighting the other guy in the room. It seemed Sayid had the dishwasher set-up for such an occassion with loads of sharp knives pointing upward. For even after Sayid got show with a tranquilizer, he was still able to take the guy and shove him down on the knives. Of course, Hurley gets seen holding a gun outside on the balcony in front of another dead body which raises his suspected Murder Tally to 3! And when you hear Hurley state that "we never should've left the Island" you get the false sense of hope that he will be an easy recruit for Jack and Ben. Teaser Clip #1 for season 5! 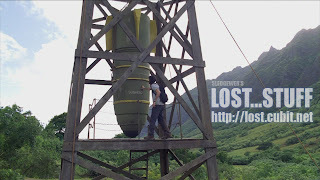 The first 2 clips have been sitting on the Lost Addicts Blog homepage since December! But alas, I will sum up. Kate and Aaron are in their home. Aaron watching cartoons (any significance to the choo choo train? I'm not looking into it!). The doorbell rings. Bottom line, Kate finds a way to defer the blood samples and requests them to bring the sheriff with them. 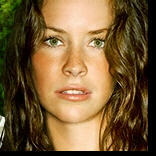 She gets her hidden stash of money, packs a bag and goes on the run with Aaron. I don't think we see Kate leave California in the first 2 episodes, but I wonder if this will come into play since part of her court settlement was to remain in the state for 10 years. I mean come on, they wouldn't have made that part of her settlement if it wasn't going to play a part! We catch up with Sun at the airport booking an Oceanic Flight to Los Angeles. She's probably using that Gold Pass they got from the Oceanic Settlement. However, before she can get too far, she is brought into a room for anothe run-in with her new buddy. For all you numbers fans you can hear 8:15 over the PA in the first clip of Sun walking in the airport. 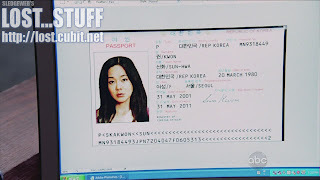 Here's a shot of Sun's Passport for anyone to analyze. I got nothing! So the man who summoned Sun was none other than Charles Widmore who was a little peeved at Sun approaching him in broad daylight and in public. "I will be respected!" Sun reveals that their common interests are in killing Benjamen Linus! Looks like Sun did pinpoint the correct person to blame for Jin's "supposed" death. (Judging by our season finale poll, and Daniel Dae Kim's casting status this season (Season regular)...the man has to be alive! just has to!) I'm guessing that ol' Jeremy Bentham must have come to Sun and explained to her how the freighter blew up. Ben viciously stabbing and killing Martin Keamy even though he knew it would kill everyone on the freighter. Sun mentioned to her Dad that there are 2 people she blames for Jin's death. I assumed one of them was Sun's Dad, which it probably still is. But they led us to think something else in episode 2 for a second! Anyway, I'm guessing recruiting Sun won't be very easy considering Jack is working with Ben! And what if Jack is the other man Sun blames? I'm guessing not, based on what we find out in episode 2. But I have my own RULES to follow! We'll talk about that later in the blog! Okay, I put this off as long as possible. Get ready to blow your mind! Once again, our Island tale resumes immediately when Ben moves the Island. When the crazy Island glow subsides, we see everyone looking exactly how they appeared a few seconds before, but their surroundings have changed (kinda). Sawyer notices that freighter smoke is gone. Locke is no longer with his fellow others but still in the same location of the island. Oh and the CAMP is gone! Sawyer goes ahead and catches Juliet up on why he left the chopper and they assume that anyone on it died in the freighter explosion. Sawyer clearly is torn up about Kate supposedly biting the dust but he does mention "all of his friends that ever meant anything" at some point in the 2 episodes. So he may even be upset about Jack as well. I'm guessing if Jin IS alive, he may get to tell them that the chopper left the freighter giving them some sense of hope. Or maybe Locke will break that news to them. I'm not so sure Jin would have been in the "RADIUS" of the moving Island. Speaking of Radius, we did see that Dan on the Zodiac Boat WAS within the Radius. And thank the Lord, Frogurt was on the boat! Before you cry Nikki/Paolo on the Lost writers/producers, Frogurt (Neil) actually has been a mentioned character since season 1 (oops Season 2 - Here's some history of Frogurt.) 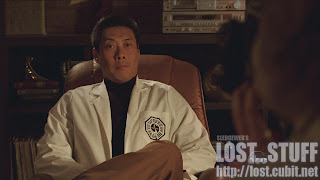 And while he never was shown in an actual episode of LOST before, he was featured in one of the MOBI-SODES prior to season 4. I mean, can you blame the producers for putting them in there? They took 7 of the characters we know and love off of the Island this season (and 8 if you count Locke's dead body!). I'm guessing we'll see more of Rose and Bernard on the island too because we need to see people on the Island we know or else what's the motivation to come back and save them??! Before we get to complex stuff...love the new nicknames from Sawyer -> Wiz Kid for Dan, Ginger for Charlotte. 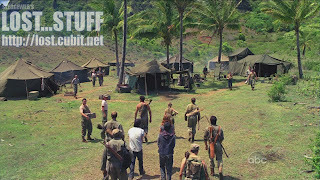 Okay, so the LOST Team isn't treading on this time travel stuff lightly. 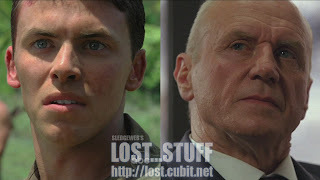 Dan will serve as our guide through these trials and they will beat into us how Time Travel works on LOST (even though they did beat this into us in various episodes before) There are some new wrinkles though. After Dan gets slapped by Sawyer after claiming he couldn't explain the situation to another Physicist let alone him, Daniel decides to try and explain. Daniel tells the crew to picture the Island as a record on a turntable, but picture it skipping (kinda like it did with Chang literally in the beginning of the episode). He said somehow when the Island was moved they may have become dislodged from time. woaaaaa huh? He then goes on to say that either the Island is moving or THEY themselves are actually moving through time. I guess we are to assume that they themselves are the ones moving. Is the Island moving too? or did it just move once? (we know it disappeared!) I'm just not sure how the people would move back and forth through time and STILL have to deal with SPACE as well. The environments on the Island are changing to how they were during the TIME that our time travelers were. The people that were on the Island at that time are there too. So I'm confused to how the Island could be moving WITH our time travelers since it had to be wherever it was at that time. Does that make sense? But at the same time, the Island DID disappear from the spot that it was in the season 4 finale, so it did move at least once! Where did it move? WHEN did it move? I'm sooooooo confused! Anyway, for some reason, it's only the Oceanic Survivors, Juliet and the Freighter 3 that are moving through time. Like I stated before, the people that were surrounding Locke stayed put. So this is bizarre in itself. I'm sure it has something to do with these people's destiny's and how they're not able to die yet until they accomplish something at some point in time. Perhaps it even will attribute to the various whispers we've heard in the jungle as the our Time Travelers are trying to avoid running in to themselves in the past! Okay, so Dan is using his trusty notebook and needs to figure out WHEN they are. He wants to find something Man-Made. So Juliet takes the crew to where the Swan Hatch used to be. Before they get to the hatch, I think they shift times to the future where the hatch is still non-existant. So they were on the Island at some point AFTER the Crash and the Hatch imposion. The Time Traveling crew is caught up to what Desmond was doing down there for 3 years before the Oceanic Crew took over. THEN the Island flashes again and the landscape changes (love when we catch Sawyer saying "Son of a....." while they are changing times!). The Hatch door is back (the one that Jack, Locke, Hurley and Kate blew open in season 1! (ahh memories!) So now they're at a time probably BEFORE the 815 crash. Daniel warns Sawyer of the reprecussions of running into Desmond who hasn't met Sawyer yet. Once again I'm confused. Didn't Desmond intentionally go to see Dan 8 years prior to them meeting, on Dan's request? Isn't the future supposed to course correct itself? So why would it matter if Sawyer ran into Desmond? I guess with Dan saying that the Island won't let Sawyer run into Desmon, that's supposed to be the explanation. Which would explain why Desmond in the yellow radiation jump suit didn't answer the door until they all left and Daniel tried alone. Daniel first consulted his notebook though...and I can only guess that he was looking at the page that said "If something goes wrong Desmond will be my Constant!" Quick sidenote - at some point Miles and Charlotte have a quick conversation to if Widmore is going to try and find them again. Miles notes that it took Widmore 20 years to find it the last time. I wonder if it had been 20 years since Charles Widmore has LEFT the island. And I wonder if that means we'll run into a younger Charles Widmore ON the Island during all this crazy time tripping. This also reminds me that this could be another way to get Rousseau's backstory since the Time Traveling crew may see it first hand! 2nd Sidenote - Charlotte is getting nosebleeds! Uh oh! Last nosebleed we saw was Desmond and Communications Guy on Freighter who died! (why am I forgetting his crazy name?) Dan looks concerned but comforts Charlotte into saying she's okay. We'll get to the other end of this sequence after Locke's story! Okay so as I was saying earlier, when the Island initially moves, all of the Others that Locke is now in charge of disappear. I've lost track of how many times the Island or the Time Traveling crew moved, but Locke wandered around for awhile looking for some answers. We got an Answer to how did the Nigerian Plane ended up on the Island when the Island was in the south pacific? Because the Island moved to that location AND time for it to happen I'm guessing. Of course, I'm still confused at how only certain people are moving through time and if the island is moving locations at the same time, but I've already discussed that! But what if the Island moved once to off the coast of Nigeria, and then the Survivors + Other + Freighter 3 somehow got dislodged in time while the Island stayed put after the move? I know it makes no sense, but if Dan can't explain it to anyone, how am I supposed to?! Locke began to climb up but then got shot down by none other than ETHAN! woaaaa Locke tries to explain that Ben put him in charge of the OTHERS and Ethan doesn't believe it for a second. And before it even matters, time changes again! Richard also gives Locke a Compass. 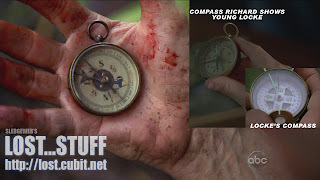 It sure looks like the Compass that he showed Locke as a Boy when Locke took the knife. Now why would Richard give Locke a compass? Remember in season one when we found out the Compass didn't point North as they thought it would? I wonder if we need to keep that in mind going forward? Or if we already resolved that one with the large Magnetic presence on the island? Anyway, Richard said that the next time he runs into Locke he will not recognize him. Richard asked Locke to give him the compass when they next meet. Now what this has to do with the "Which of these BELONGED to you" scene when Locke was a boy? No idea. Time shifts again while Richard is talking and Locke is back in the past again with the Plane in the tree. (Anyone starting to get a Quantum Leap vibe here? Man I loved th show! So, as Dan is talking to Desmond on the Island, he begins to shift time and then we follow Desmond to the Off-Island future. He wakes up. Penny is there. He says he was on the Island. Apparently Desmond was suddenly infused with the memory of his conversation with Dan. (Does this mean that when Desmond talked to Dan in the past at Oxford he was suddenly infused with THAT memory?) And why would Desmond get the memory at THAT exact moment? They have been off the island for 3 years at that point? Oh well...it's a TV Show, I'm sure they have their ideas! I can't worry about it too much, because it was AWESOME! We find out that Desmond and Penny are living on a boat off the cost of somewhere nice. Must still be in hiding (remember Jack telling him "Don't let them (or him) find you" Anyway, Desmond tells Penny that he HAS to help his friends and that they're going to OXFORD! We open up with what I guess can be considered a Flashback of the Oceanic 6 (before they officially became the Oceanic 6) discussing the plan on Penny's Boat "The Searcher." Basically this scene was to add more weight and explanation to the whole "LIE" that they kind of rushed into the season finale last year. Jack explains that while they are protecting the people left behind (from Widmore and goons who sent people there to kill them all) they also are protecting themselves from being seen as CRAZY. Who would believe in a land full of smoke monsters, others, word saving 1980 Computers, and disappearing Islands? Penny adds that there will be no way to call her father off the search. Frank makes an appearance! He says he'll go with the flow with whatever they decide. The cop is Ana Lucia! Yet another Ghost visiting Hurley. She gives instructions to Hurley on what to do. Get new clothes, get to someone you can trust. Oh and Libby says hi! Wait, so do these ghosts all gather somewhere to hang out? I'm guessing we won't get an answer to the visions until the final season. And I imagine it will be as bizarre an explanation as the Time Traveling Island and Inhabitants! 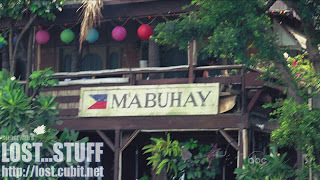 Hurley pulls over at a convenience store, pops some shades on Sayid and heads into the store. Gets him an "I Heart Shiht-zu" T-shirt (yep can't spell it...but I always think of Dumb and Dumber when I think of that dog!). The cashier recognizes him and Hurley is on the TV as a 3 murder suspect. Not much here except suspense! Hurley takes Sayid to his parents' house and tries to get Cheech (errr Hurley's Dad) to help. The pressure of the lie begins to build on Hurley as he wants to confess. Hurley is too paranoid to take Sayid to a Hospital (See: Godfather) so he asks his father to take him to Jack. Stay tuned! 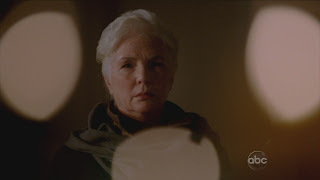 Meanwhile Hurley stays behind with his mother and confesses the whole truth about the Oceanic Crash. Smoke Monsters, Others, Moving Island and all. And just when you think he'll be dismissed as truly crazy, Hurley's mother believes! Woaaaa...this happening to the same dude that whenever he said he had bad luck, everyone dismissed it! One more scene with Hurley, but we'll hold off for a sec! Kate is in her car looking at a map and we see her looking into Beverly Hills or something. (I guess she wants to go see how Dixon is doing with Choir practice...man that reboot 90210 show is awful!) Anyway, she wants to call Jack but can't bring herself to do it (awwww). Instead she gets a call from an old friend. 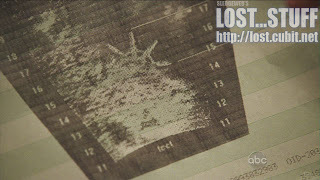 I was beginning to think it was Sawyer's Baby-Mama Cassidy, but nope...it was Sun, whom Kate goes to visit. Sun shows a picture of Ji Yeon and we find out that they must not have spoken since the Press Conference, as Kate didn't even know the baby's name. We get some pseudo flashbacks (aka clips from the finale) where we see Kate going after Jin, but then ending up back on the chopper. Right when we think Sun is going to name Kate as the 2nd person she blames for Jin's "Death" she says that they all probably would have died if she continued to go after Jin. She tells Kate she doesn't blame her. But then asks how Jack is! Now if you recall, Jack is the one that grabbed Kate and brought her back to the chopper. But again, I think Sun blames her father and Ben for Jin's "Death" And I wonder if when Sun encounters Ben and is ready to kill him, that Ben will have knowledge of Jin's whereabouts. He is always 10 steps ahead of everyone! ADDED -Whoops, forgot to mention that Kate told Sun about her issue with the people asking for the blood test. Sun stated that whoever it is does not want to expose the LIE. They want the baby! Hmmm....who could it be? We begin with Jack and Ben packing up at the motel. Then they go their separate ways eventually. Ben tells Jack that he dumped his drugs. Loved that exchange "I was going to do the same thing" "Well I figured you were!" Great stuff! Ben tells Jack to go home and pack anything that you want from this world because you're never coming back to which Jack says "GOOD" Wow....Jack has really done a 180 since his quest to get everyone off of the island. Eventually we get to a point where Hurley's Dad brings Sayid to Jack. Cheech tells Jack to stay away from his son as Jack doesn't have Hugo's best interest's at heart. So Jack calls Ben and tells him about the situation! 1 Oceanic 6'er recruited - Jack revives Sayid and after some choking they are fine. 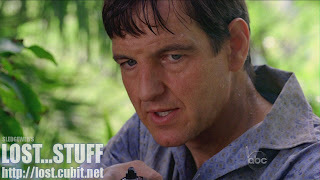 Jack catches Sayid up to what happened with Hurley. Sayid asks if anyone else knows about the situation. Which I'm guessing leads to Jack totally catching Sayid up with the Benjamen Linus business. But this is the last we see from these 2 for this episode. Ben is on a mission to put Locke's Corpse in storage until they're ready for it. He goes to a Butcher Shop and this is where we continue his story. Ben's Ticket at the butcher was 42. oooh numbers! Love me some numbers! There is also mentions of Gabriel and Jeffrey....hmmm who are they? Anyone we've met yet? But they're in on the plan too. We find out, as Sawyer puts on a shirt, that all of their belongings that they had with them are time traveling too. Huh???? This one I thought was kind of silly. But, hey whatever works. I'm not questioning the show at this point! Dan arrives back at the camp and says he needs to calculate where they are in time. There is more Frogurt to go around for everyone to enjoy! Charlotte's condition worsens as she gets continual headaches and is having trouble remembering things like her mother's maiden name. She suspects that Dan knows what is happening to her. At some point Miles went out to look for food and I think he brought a dead Boar back to feast on. He knew the boar was dead for 3 hours (probably more of his ultra-sensitivity to the Dead and Ghosts at work). Anyway, Neil/Frogurt starts flipping out and thankfully a flaming arrow strikes him in the heart. GOODBYE FROGURT! We hardly knew you or missed you! Of course, then a barrage of flaming arrows come their way. When exactly are they? It can't be too long ago, because I thought the plane was still on the cliff during the last LEAP (yep, I'm going with Quantum Leap terminology now). Anyway, there is a new threat on the island for them to deal with and we're not quite sure who they are yet! Anyway just as we think all hope is lost for Sawyer and Juliet, Locke shows up with his knife and slaughters the two dudes. Ahhh and everyone is reunited again. UPDATE: After rewatching this, it looks like Locke didn't kill everyone. In particular, the man that was doing the talking was captured not killed. I'm even more convinced now that this guy is either Charles Widmore himself or that these military dudes are in some way related to Widmore. I think I've done enough time travel theorizing for one day and I'm sure we'll have plenty more to chew on in a 1 hour episode week! Well, I guess we still have ONE more Time Travel subject. 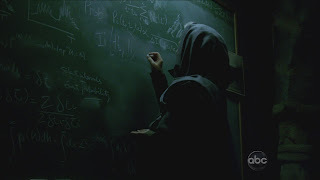 Back in the "PRESENT DAY" (or Oceanic 6 timeline), we see a cloaked woman typing on a computer, and watching a pendulum swing and mark some kind of crazy axis. She's writing formulas on a chalboard. 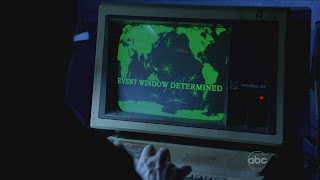 We see a screen that says "EVENT WINDOW DETERMINED"
And we find out it's none other than MRS. Hawking! (the woman from the Jewlery store who confronted Desmond in his "Flashes Before Your Eyes" episode, and also pictured with the Monk where Desmond studied to be a BROTHAAAAA!!!! So Mrs. Hawking DOES have a big role to play in this unwinding story. We always suspected she would! Anyway, this little techno/ancient area is in the basement of a Church where she has a discussion with ol' Benjamen Linus! She informs Ben that he has 70 hours to get them all back to the Island. Ben asks what if he can't get them ALL to go back at one time. Then she says the line that we opened up this 2 hours with "Then God Help Us All!" Whew, I'm tired! That's a lot of writing for a short amount of time. Anyway, looks like even Ben has someone to report to. So who exactly IS Mrs. Hawking? She apparently can track the Island, and that computer looked eerily similar to the DHARMA computers. But is she the one responsible for bringing all people to the Island? Also, could she be Dan's mother that Desmond on his way to find? Only issue is, she's in Los Angeles, and Desmond is going to Oxford! I'm sure we won't get all of the answers quite yet. But this was one crazy scene and I'm dying for more! But for now, I'm going to let that be it! I'm glad to be back blogging about the best show on TV, and I hope you're excited to keep reading and commenting! We're back folks! And what a way to come back. Blowing our minds into Yesterday (or Tomorrow!!) With that, I take my leave. See you next week and comment away! NAMASTE!